In just over a week, Dunia Baru will be setting sail from Maumere (the largest town on Flores, and on the island’s north coast) for the beautiful Alor Archipelago… and for our guests who’ve been dreaming of diving in Indonesia and experiencing some of the richest marine habitats on this planet, this is going to be one luxury yacht charter they’ll remember forever: the diving in this part of Indonesia is absolutely spectacular. Like Raja Ampat, the Alors benefit from the collision of the Pacific and Indian Ocean currents and the marine habitat here is superbly rich. There are hundreds of coral species and thousands of species of fish, and with over 50 dive sites to choose from, our guests are likely to see a wide variety of stunning marine life: from sun fish to rays (manta, eagle, reef and devil), turtles, black coral trees, hairy frog fish, ghost pipe fish, sea horses, sharks, spotted sting rays, turtles, box fish, scorpion fish, clown fish… need we go on? 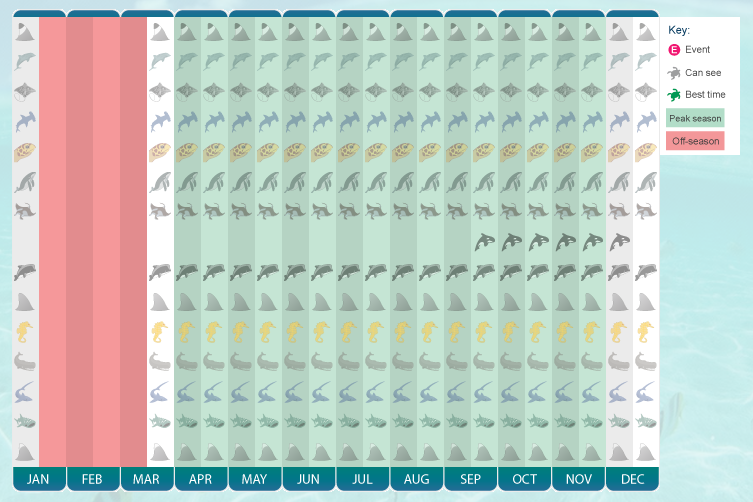 The marine life chart above is from the website Dive Report, and shows what species are in the Alors during the different months of the year. As you can see, late March until early January is an excellent time to be in the Alors with sperm whales, whale sharks and humpback whales in the waters around the archipelago during these months. Year-round the water temperature is sublime: between 26 and 29 degrees celsius, and visibility often up to 40 meters. As we said, diving in this part of Indonesia is likely to be an unforgettable experience. The islands are as rich in culture as they are in marine species: there are said to be 15 different indigenous languages in this little archipelago alone. Take a read through this post, from one of Dunia Baru’s previous voyages through the archipelago, where guests visited a village where whale meat is the currency. Dunia Baru, please contact your broker.